Brown and glossy checker piece in your arms. Very nice and elegant to see. 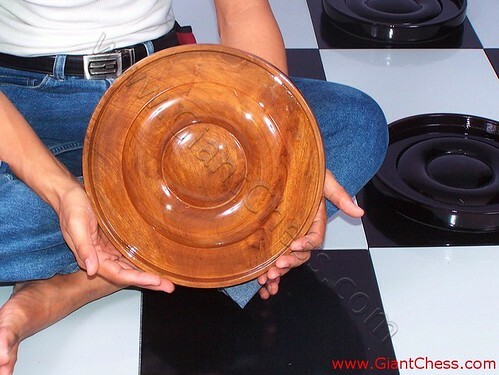 The checker in the picture above called as Big Checker Piece, made of best Teak wood and has high quality. Because of its quality, the product is very durable for outdoor and indoor use. You may play checker game at your garden or backyard in any seasons and weather, the checker set very safe to left outdoor. The checker product carved by our expert craftsman. Look the detail on the picture. It very unique and has carved carefully. Many kids and adolescent like to play big checker pieces at garden. You just need flat area and arrange the board there. Then checker game can be so interesting with new nuance. The checker pieces is easy to move, eventhough they categorized in big checker pieces and made of Teak wood.